Who doesn't like half price pizza? Give up? The answer is nobody. Some people may not be the biggest Papa John's fans, myself being one of them, but on a Friday afternoon when I can order a bacon/mushroom/pepperoni pizza, buffalo wings, bread sticks, and cheese sticks for around $20, I don't really care. And now there is a now a new website that will change your pizza eating life. I am typically on top of this deal, using it at least 20 times saving hundreds of dollars last year when the Caps were crushing it. I actually used it so much that looking at Papa John's logo makes me sick to my stomach. But for those of you who aren't obsessed with pizza, twitterer @BenPackard has you covered. 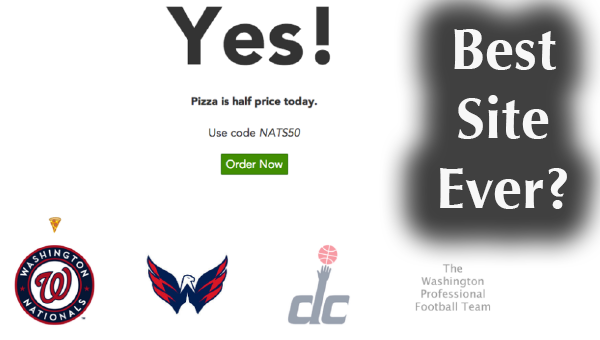 Ben created IsPizzaHalfPrice.com, a site that tells you if you can get a half price coupon at Papa Johns. The more seasoned site was assembled utilizing a static distributed model that implied we needed to make a "format" for each perspective of our substance we needed to present to the gathering of people, making it a great deal all the more immoderate to re-reason and convey to various areas of the site and crosswise over portable as well as the pages were made bespoke for every game.